 Broadus AE. Mineral balance and homeostasis In: Primer on the metabolic bone diseases and disorders of mineral metabolism. American Society for Bone and Mineral Research. Favus M J Ed;2003:105-11. 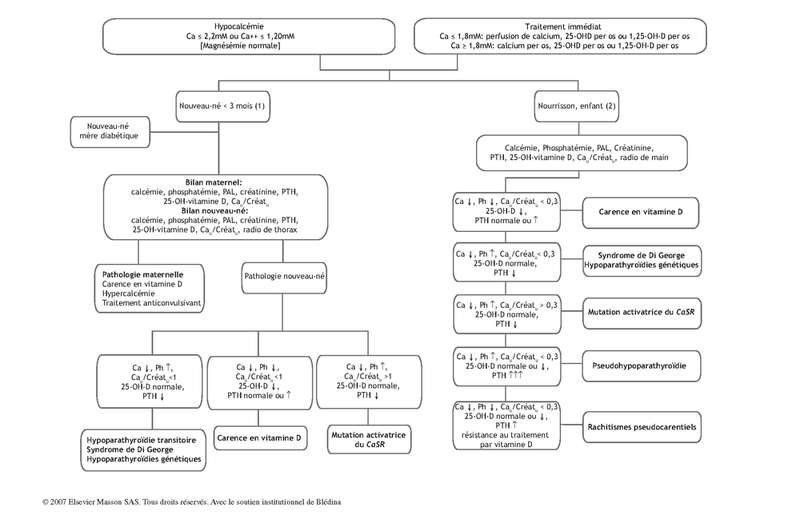 Linglart A, Lienhardt A. Interactions materno-fœtales et pathologies du métabolisme phosphocalcique. Arch Pediatr 2005;12(6):766-70. Weinstein LS, Yu S, Warner DR, Liu J. Endocrine manifestations of stimulatory G protein a-subunit mutations and the role of genomic imprinting. Endocr Rev 2001;22(5):675-705. Daw SC, Taylor C, Kraman M, Call K, Mao J, Schuffenhauer S. A common region of 10p deleted in digeorge and velocardiofacial syndromes. Nat Genet 1996(13):458-60.